The controls are mirrored for the front right-hand seat. 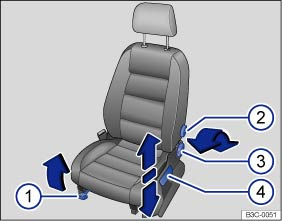 ① Pushing the front seat forwards or backwards. Lift the handle and move the front seat. The front seat must engage after releasing the lever! ② Adjusting the lumbar support Turn handwheel. ③ Adjusting the backrest. Turn handwheel. ④ Adjusting the seat height. Move the lever up or down, several times if necessary.